This Saturday, a few of our friends got together and had a potluck-style day of feasting at one of our friend’s apartment in Brooklyn. We had planned this for over a month and Bobby, the guy who lives in said apartment, and me were planning the menu for weeks. Clearly, we’re both food nerds. We wanted to keep it fall-themed, sort of like a “welcome to fall, that’s a great excuse to get together.” Funny how you need “reasons” to rally the troops, right? It’s true though – as often as I see my friends, it’s so tough to get large groups together. Specifically, with this group, there are babies – Bobby has 18 month year old twin girls (so precious I can’t even) and Lu’s best friend Scott has a son who’s a little over two years old. Hence, get togethers need to be scheduled in advance and this time, we went with a fall theme! My responsibilities were to bring a crostini, a salad, an appetizer and make a dessert. For those of you who haven’t heard me say it before – I’m a terrible baker. I’m always measuring improperly or haphazardly and I can’t stand the way flour gets everywhere when you’re sifting and mixing and pouring. I always forget an essential ingredient or mess up the baking soda/baking powder. Anyway, I made a really good banana walnut chocolate chip bread with a homemade cream cheese frosting (none of which were remotely healthy, but hey – a fall get together calls for a little celebratory indulgence.) I was pretty proud of myself. Then, of course, I had to make something spiralized. Since I was traveling from Jersey City to Brooklyn for this, I figured I’d keep it easy and simple and spiralize apples. Brussels sprouts scream fall and winter to me, so after spending way too much time trying to write my own recipe, I decided to google “brussels sprouts” and “apples” and make the first easy recipe that popped up. Not only was this a crowd-pleaser at my fall get together, I threw in some thinly sliced chicken the next night for dinner and Lu devoured about 4 cups of it! 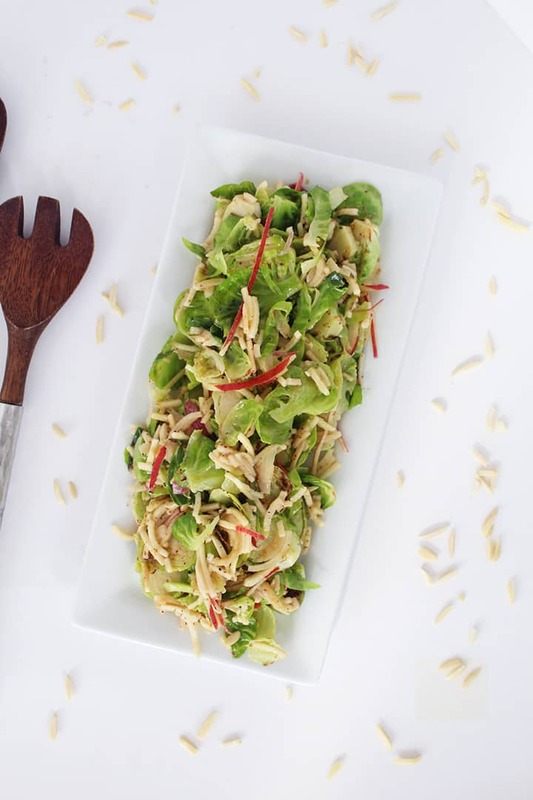 The spicy sweet mustard dressing over the warm brussels sprouts is absolutely divine – you honestly won’t be able to stop eating it. 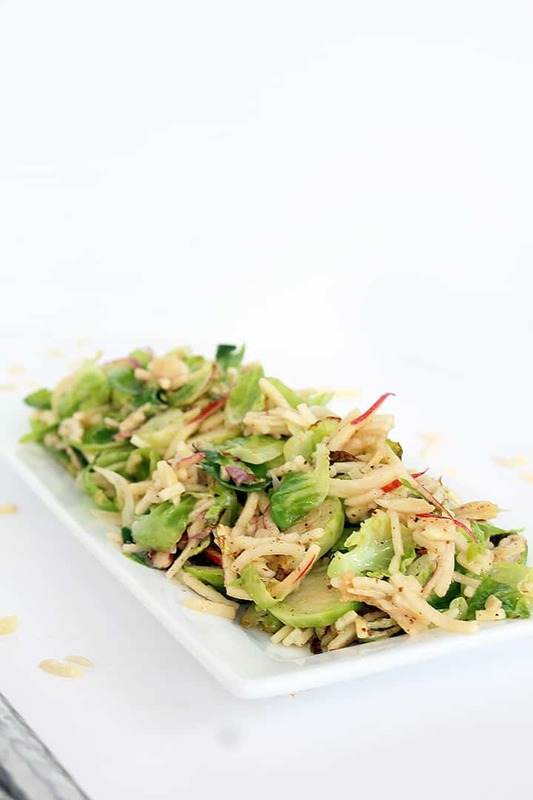 The almonds are the perfect crunch and the apples really bring out the sweetness in the mustard mixture for that well-balanced spicy, savory and sweet combo. This dish definitely needs to be brought to many fall get togethers around the world! Can you help with that? What are your favorite dishes to make for fall get togethers? To make the sweet hot mustard, in a large bowl, whisk both mustards, apple cider vinegar, honey and sriracha sauce. Set aside. Place a large skillet over medium heat and add in ½ tablespoon of the olive oil. Once oil heats, add in the shallots, season with salt and cover, letting cook for 3-5 minutes or until lightly caramelized, shaking the pan occasionally. Once done, remove the shallots with a slotted spoon and into a large bowl with the sherry vinegar, mustard mixture, 1 tablespoon of the olive oil and season with salt and pepper. Set aside. Place the large skillet back over medium-high heat and heat the final two tablespoons of olive oil. 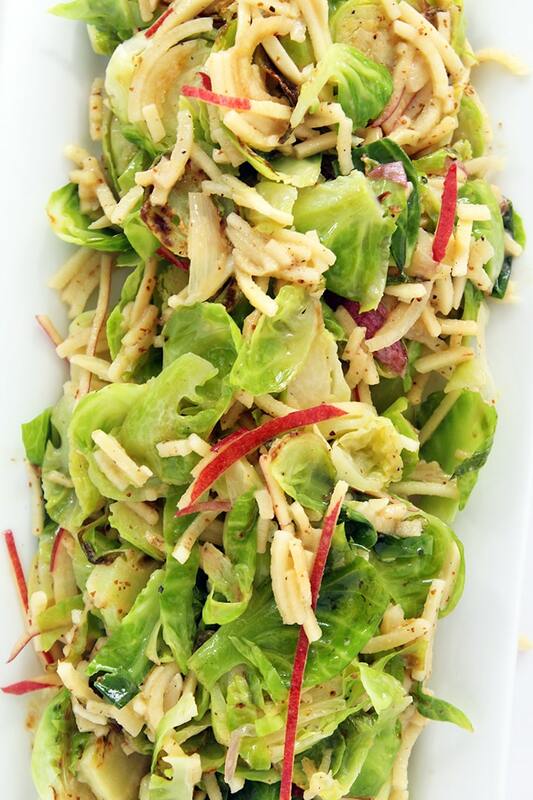 Once heated, add the brussels sprouts and season with salt and pepper. Cover and cook, stirring occasionally, until the sprouts are just tender and lightly browned, about 8-10 minutes. Transfer to the bowl with the mustard-shallot mixture and add in the almonds and apple noodles and toss. Arrange on a platter and serve. love the Fall themed party..it makes it so much more fun, no? How are the apples prepared? It doesn't say in the recipe. I'm new to spiralizing so a little more info is helpful. 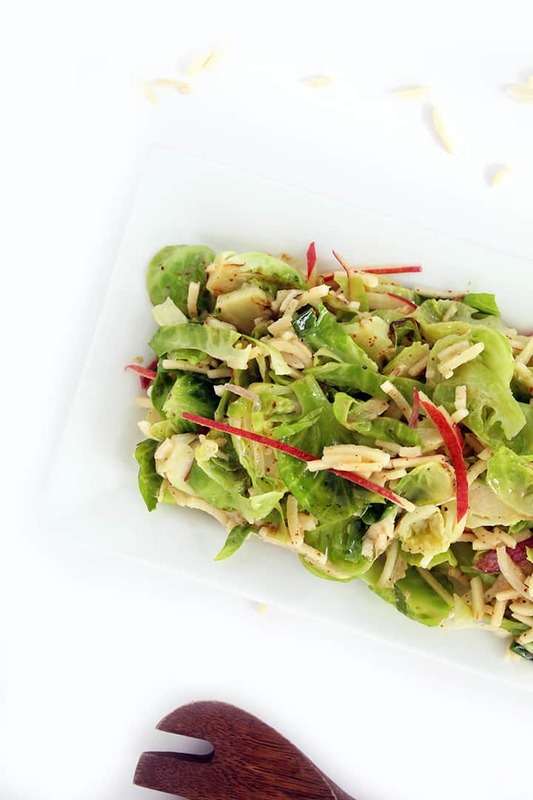 We love Brussels sprouts and I'm excited to try this! I'm with Kim - can you tell us how you did the apples? Blade C might make them mush?? Thank you!!!! This has wonderful eye appeal and I can hardly wait to make it! Questions about the apples: Did you cut them into small sections after you spiralized them? They don't look like the long noodles that come out when I do them. If you did cut them; did you do it prior to sprializing them or after? Did you core the apple and if not, how did you get rid of the seeds and tough core? Thank you! What is a good replacement for the sherry vinegar? I don't like to keep a 100 different vinegars in my pantry so I only have ACV, white, and red wine. Thanks for all you do, I've made so many of your recipes for "date nights" with my boyfriend and have loved all of them. Thank you - happy I'm sprucing up date nights :) I would suggest investing in sherry, it's a nice addition, especially during the holidays for added sweetness! Other vinegars that can sub in if you can't find it are rice wine vinegar, champagne vinegar and white wine vinegar (which you have) would be my last suggestion! Hi Ali~saw this today and made it tonight. I had last night's grilled sprouts that I cut smaller and heated on low to just warm. I used Champagne Balsamic, onion powder for shallots, only Dijon, & English walnuts since that is what I have on hand. Sriracha only in His dressing. It was good! Will make again maybe giving it an Asian flavor with Honey or Brown Sugar, Liquid Aminos and a touch of Toasted Sesame Oil and walnuts (omitting mustard). The apple should go well with that too. Might try the bigger blade (B?) for more apple flavor. Thank you for another interesting recipe. I'm with Lu...cup fulls! This was delicious! Topped it with a little FF crumbled feta and served it with a grilled sausage...couldn't stop eating it! Yummmmm! This looks like the perfect fall salad. I'm thinking it might be great for Thanksgiving! This sounds really good and I will try it as soon as I can figure out what sriracha sauce and whole grain mustard is. I wonder about the med-high heat with olive oil. I understand that olive oil is only supposed to be used (healthy) on lower heats and I am always left scratching my head when recipes call for olive oil on higher heats. Maybe walnut oil? Anybody have any alternative suggestions? We had this salad tonight and it blew everyone's socks off! The 1st person who tasted it said that he'd never had so many flavors on one fork in his life. This salad was the star of the meal. I am planning on having it for Thanksgiving every year from now on. Thank you so much! This was great -- thanks so much for the recipe; my husband LOVED it! I do think I'll use more Brussels sprouts next time, though -- maybe 1.5 or 2 lbs.? There was a lot of sauce involved and I wanted more sprout action; I think more sprouts will spread out the sauce a bit more. But the flavors were SPOT ON!!! I just made this for my lunch with a few substitutions because of items I didn't have. Delicious! I wanted to try this before I served it to my husband. I was glad I was alone at home when I did. No one saw me lick the bowl! ;) Delish!!! If I dont have sherry vinegar can I use peach vinegar or white rice vinegar or balsamic vinegar? Try peach vinegar, I think it would give it a nice sweet kick that's like the sherry! Hi - how long will this dish keep in fridge? I want to make it for lunch for a few days at work if possible. Thanks!